Editor/Author Blyton, Paul, Heery, Edmund and Bacon, Nicolas, et.al. Globalization, the decline of trade unions, the spread of high performance work systems, and the emergence of a more feminized, flexible work-force have opened new avenues of inquiry. 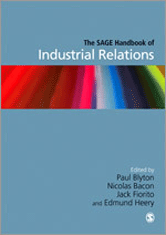 The SAGE Handbook of Industrial Relations charts these changes and analyzes them. It provides a systematic, comprehensive survey of the field.